I am writing this after reading a trending post on some Italian travel blogs I follow (linked at the end of this post). I don’t blog in Italian and I don’t blog about travel (as my main topic), but I like to share stories and this trending post felt like a good opportunity to write about stuff I love. The original post was called #prime10volte, that is to say “ten first times” when travelling. Travel is about exploration and learning so it should come as no surprise that while travelling one gets to experience many “first times”. So here’s 10 of my first times while in travel. #1: the first time I travelled by air. It happened on the day of my 5th birthday, the 25th of October, 1991. (This should also count as first birthday spent abroad.) We were on our way to Poland for a wedding, so we took the plane instead of the car. I don’t really have memories of the flights, but I remember Frankfurt airport, I remember the tiny Lufthansa cutlery (they served us food onboard), and I remember getting a birthday cake that night (which was the thing that mattered the most to me, after all). Seeing the adult that I’ve become, I must admit that the picture my dad snapped of me during our layover is one of my most favourite photos. Lufthansa takes the credits for my “maiden voyage”. #2: the first time I visited another continent. In the summer of 2004 I went on an epic mother-daughter trip to the US for 6 weeks. We were mostly based in NJ visiting relatives, and took some trips from there. It was not only my first time setting foot on another continent – it was also the first time I took a transatlantic flight, my first time on a Boeing 747, my first time in America, my first time being in control of everything because my mom doesn’t speak English so I had to do all the talking everywhere myself. It was also the first time I fell in love with New York City (I fell in love with that city again some years later, and will probably fall in love again every time I visit in the future). #3: the first time I saw the Pacific Ocean. Even though I am not constantly by the Atlantic Ocean, the fact that many countries in Europe lay by the Atlantic makes it feel somehow more familiar to me. The Pacific, on the other hand, has always had an exotic feel about it. In the spring of 2012 I finally made it to San Francisco on my own and there I saw the Pacific Ocean for the first time. A few days later I travelled to Los Angeles to visit a friend and together we went to Santa Monica to watch the sunset there. And I’ve seen many sunsets, but I must admit that that particular sunset over the Pacific was utterly beautiful. #4: the first time I realised I had a different identity abroad. When you get to spend some time in a different environment, this changes you. This is not my theory but it is something that many people experience when they change city or country. I think it happens because you want to fit in a different environment, and the more you are willing to embrace the new and let go of the old, the more this will ultimately be reflected on your personality. Looking back I can definitely say that I have lived parallel lives every time I got to stay in a country for a longer time than just for a holiday. The first time I came to realise this it was when I spent 6 months in Oslo. That girl in Norway was not the usual me, the me from back home – it was the Oslo me. Later in life I got to meet all my other different identities in the other places where I got to stay for some time, but I will never forget that first time I got to acknowledge the existence of an alternative me, the Oslo me. #5: the first time I didn’t have a bed to sleep in throughout a whole trip. Norway 2009, I was an Erasmus student at the University of Oslo and together with other 4 girls I took a trip to the west coast. Low on budget, we planned our trip so that we would always be travelling during the night. The first night was spent on the Oslo-Bergen train – of course not in a sleeper wagon but on a much cheaper regular train seat. The following evening in Bergen we boarded a Hurtigruten ship bound to Trondheim; the sailing would take two nights and one full day, and we didn’t have a cabin. So in the evening we would lay on the couches in the common areas and sleep there. We got to Trondheim in the morning of the fourth day, explored it the whole day and returned to Oslo in the evening. Four days away, many adventures, not one night in an actual bed. The common room on the ship when we took over the first night. Ikea pillow and purple tartan scarf to the right: that was me. #6: the first time I slept in an airport. In March 2011 I took a very quick trip to Dublin to meet up with some friends. We come from all over Italy and always had to travel to meet, so we figured why not meet up abroad this time? So we did, and we planned our next meet-up in Dublin. Some of them stayed longer, while one friend and I could only afford to join the group for two days (Tuesday-Thursday, notably the cheapest days to fly). Both our flights back (to two different airports in Italy) were super early in the morning, so we decided to cut on accommodation costs and spend the second night at the airport. I had never had the chance to do that before, so the couches of Starbucks at Dublin airport were my “bed” the first time I got to sleep in an airport. #7: the first time I drove an automatic car. This may sound odd to some people, but it was a pretty special experience to me. I drove my first automatic car during our Balkan road trip last year and I find it pretty hilarious. I am not an enthusiastic driver – I will do it out of necessity, but when I can choose I’d rather take the passenger seat. But on our road trip we took turns at the wheel so I had my share of driving and the car we rented was automatic. Unlearning to use my left foot was a traumatic experience. I still remember hitting very hard on the brake when making a U-turn because my brain really couldn’t process that there was no clutch pedal when I was so ready to shift gear. That also made me realise how hard on that pedal I normally am. The funniest thing about this all? I drove that car only for a couple of days but the first time I sat back in my car for a brief moment I had forgotten how to drive stick. So confusing! The car. In the background, the tiny stretch of Bosnian coastline. Not included in the picture: the 15 croissants I bought at the gas station where we had stopped. For croissants, of course. #8: the first time I wished I didn’t have to go back. This has got to be Norway again. 2007, my first time in Oslo. That city had me completely head over heels. I remember glancing back at those forests just before entering the plane to fly back to Italy and thinking: “Why am I not living here?”. I made a promise, that very moment. I promised myself I would return. And I did (you can read my romantic post about Oslo here). And then I promised myself that one day I would settle somewhere north. And I did. #9: the first time I gave some sports a try. I am not a sports person. I tried volleyball and took swimming lessons as a kid but to no use. I am just not very good at it and I lack the motivation. I have tried to get better at this as an adult and I am regularly out cycling in the summer now – that I enjoy. I have also given pilates and yoga a try and I like them, I seem to enjoy the challenge of holding a posture more than doing repetitive fast movements instead. Travelling has made me open up to sports in a way, I don’t think I would have ever tried some things back home. Nothing extreme, mind my words. But it was in Norway that I tried for the first time cross-country skiing. In Poland I tried downhill skiing. 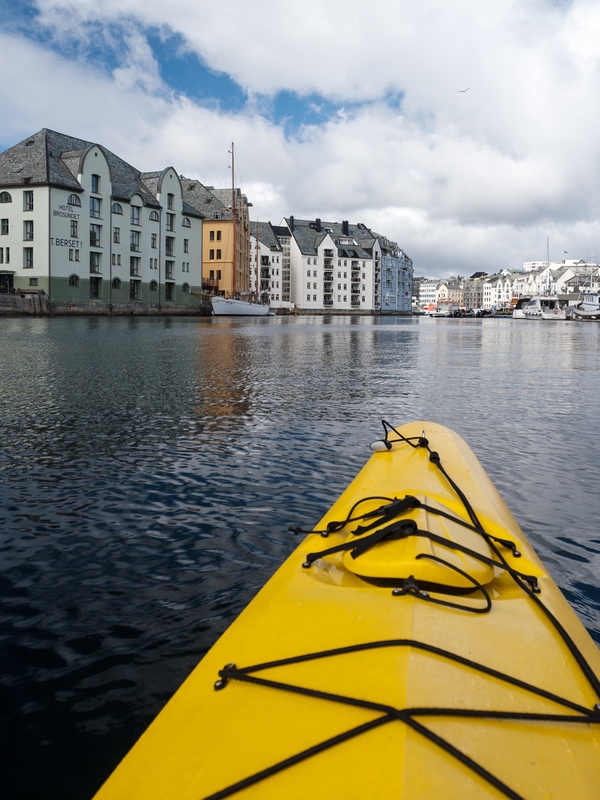 In Norway again I tried kayaking. In Zanzibar I tried snorkelling – okay, that is maybe not a sport but it implies floating in the sea and I am a very poor swimmer and swimming in the open sea where my feet don’t touch the gound freaks me out. But I had this incredible experience to try and I didn’t let my poor sports attitude stop me. Which is the same thing that brought me on the tracks in Oslo, on the slopes on the Tatra mountains or gliding over the Atlantic in Ålesund. Travelling gave me the push to give sports a try. Ålesund seen from my kayak. Read the whole story here. #10: the first time I’ve been hospitalized. I call myself pretty lucky that in 30 years of life I have only spent the night in a hospital once. I made a whole blog post about this adventure, but long story short I suffered from a kidney stone in the middle of my return trip from Zanzibar, it got so bad that they checked me into the airport clinic in Abu Dhabi (my layover airport), after a checkup I was deemed unfit to fly the next leg and got transfered to the actual hospital for proper medical care. Ended up spending the whole night at the hospital. Got my first ambulance ride, my first kidney stone, my first shot of morphine, the first time I was denied boarding. And for the first time I was rebooked onto a different flight two days later. I am planning to write another similar post in the future but food-related, so if you’ve enjoyed this one and you want more food stay tuned! A great idea for a post, thank you for sharing your stories. I love the picture of you at the airport. Thank you. I thought it was a fun post to write. Please feel ispired to write your own – I have nominated two Italian bloggers, but anyone is welcome to share their stories really! Thank you! I didn’t nominate you, but if you’d like to feaure this type of post on your blog please do! As you said, it’s fun for the readers, but it’s also really funny to think back of what to feature!! 🙂 I might actually do that sometime in the future! This is a great post idea! You have some really cool firsts! Thanks! I’d be curious to read yours, please let me know if you’ll have one such post!! That picture is very dear to me 😀 Back then I had no idea airports were to become one of my favourite places. Io ce l’avrò prossimamente quello sul cibo, li ho scritti in contemporanea perché un sacco di prime volte in viaggio erano riferite al cibo. Lo pubblicherò presto, non li volevo troppo consecutivi. Non vedo l’ora di leggere il tuo! You should write down your 10 first times, I love reading this kind of personal stories, too! What an absolutely wonderful idea. Travelling is so much fun and after a while, we can forget some of these more precious moments. Sounds like you’ve had your fair share of adventure! Great stuff! Thanks Olivia! I’m glad you like the idea and my stories. Can’t take credits for the idea as it was a trending tag among Italian travel bloggers, but I just had to participate. It’s great to share the stories behind our travels. Please feel inspired and take part yourself! !